What would you do if your doodles became real? If they rose right off the page, turning tangible, and through them you could fly to the moon, discover the deep sea, or visit remote jungles? 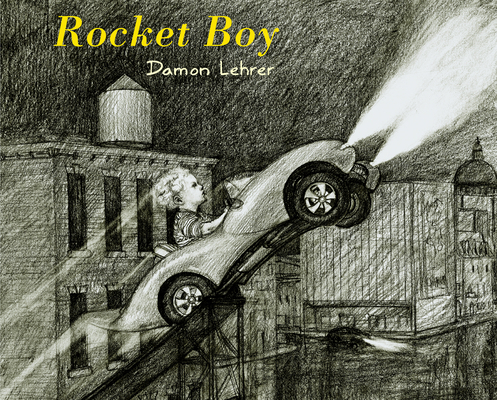 In Rocket Boy, a bewitchingly wordless black-and-white picture book reminiscent of Harold and the Purple Crayon, one young child explores the boundless reaches of his imagination. Armed only with a pencil and a pad of paper, he transports himself into adventures where he meets new friends, visits unseen landscapes, and makes his way back home again to his own bed before dawn. Damon Lehrer's visual narrative, a penciled mix of line work and detailed graphite drawings, materializes in the mind, making the use of words superfluous. Lehrer opens up a charming imaginary world to readers of all ages through this little boy who quite literally draws us in.